If anybody knows me, they know cancer is on my sh*tlist...big time. Although I'm not a huge fan on testing anything on animals, if it will help someone, I'm in. A rainbow trout can inspire and inform. It can lead a young fisherman to a life-long career studying human health. It can reveal the risks of carcinogens, and help develop treatments to prevent cancer. It can become the centerpiece of a world-class research facility that may reshape how government agencies regulate environmental toxins. George Bailey knows all this and has plenty of fish stories. As a professor, he spent three decades studying disease with trout in his aquatic laboratory at Oregon State University. From outside, the building sits on a dusty lot just outside of Corvallis and doesn't look like much. Walk inside, and you'll find a bustling laboratory. The air is cool and the fishy smell is surprisingly slight. Eggs and fry swirl in large glass cylinders off to one side. Once they're big enough, the fish will graduate to the hundred gallon tanks that pack the huge central room, which covers a third of an acre. There is constant activity as the dozen staff members prepare cheesy fish food and systematically check the tanks. "What we have here is the only facility of its kind anywhere in the world," says Bailey, 68. "Completely unique." 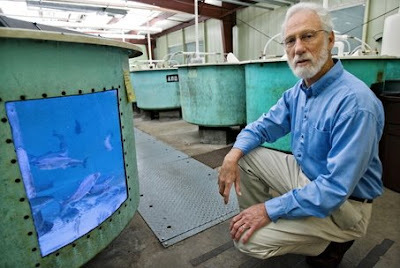 George Bailey helped build the world-class trout research facility at Oregon State University, and recently retired after his team completed a sensitive study of the carcinogen DBP. He officially retired six years ago, but continued to work at half pay to complete the capstone of his career, the most accurate study of the chemical DBP, an environmental carcinogen. The results, published in May, were surprising. "It was known to be a powerful agent," Bailey says, "but there wasn't much information." By using trout, Bailey measured risk of DBP at low exposures, and found reducing exposure by half meant less than half as much cancer. The Environmental Protection Agency calculates a proportionate risk level from high exposure data. In essence, the EPA guesses conservatively to compensate for lack of data. But Bailey's fish gave him low exposure data so he could pinpoint the risk. And for DBP, Bailey found that the EPA would overestimate the cancer risk by a factor of 1,000.